What do you do when you know someone hasn’t finished a project that needs finishing, and this person hasn’t finished it because he or she is not able? Do you help? If it’s something you specialize in, do you offer to finish it? As it turns out, I’m guilty on all charges. Not only did I offer to help, but I offered to finish these quilts. It started out to be one quilt. My husband’s Aunt Joyce has this quilt that she had started in the late 1980s, possibly in the early 1990s. She was planning on giving it to her son when she finished, but she never finished it. And… it was hand quilted… well, what she got done, which was most of it, was hand quilted. All she had left to do was 2 borders and the cornerstones. I’m not a hand quilter, and I haven’t been a hand quilter since I started my first full-sized quilt. It’s just too hard on my hand and wrist and it takes waaaaay too long – I don’t have the patience for it. But, Aunt Joyce is like a second mother to me, and I just can’t leave it unfinished for her son. She’s in her mid 80s. So, I offered to finish it for her. When I was looking for the matching fabric for the borders that she had stashed away, I found a quilt top that looked very much like the hand-quilted one. I figured I could finish that, even though it needs to be quilted entirely, by machine pretty quickly… probably sooner than the hand-quilted one. I think I’m going to quilt feathers into the borders – there are plenty of wide open spaces. I didn’t know which side is the top, so I put the blocks that I thought might have the most stretch at the top, specifically the block with the hexagons. That way I can try to tame it before it gets “stretched in” to the bottom. I hope I can do this quilt justice. The blocks were hand pieced. This is one of those dilemmas where you don’t want to sabotage a hand-pieced quilt with machine quilting, so what do you do? I don’t have time to hand quilt it, so it’s going to have to be machine quilted. I will, of course, continue to hand-quilt the one that was started that way. I think it would bastardize it at this point to machine quilt it since most of it is hand quilted. 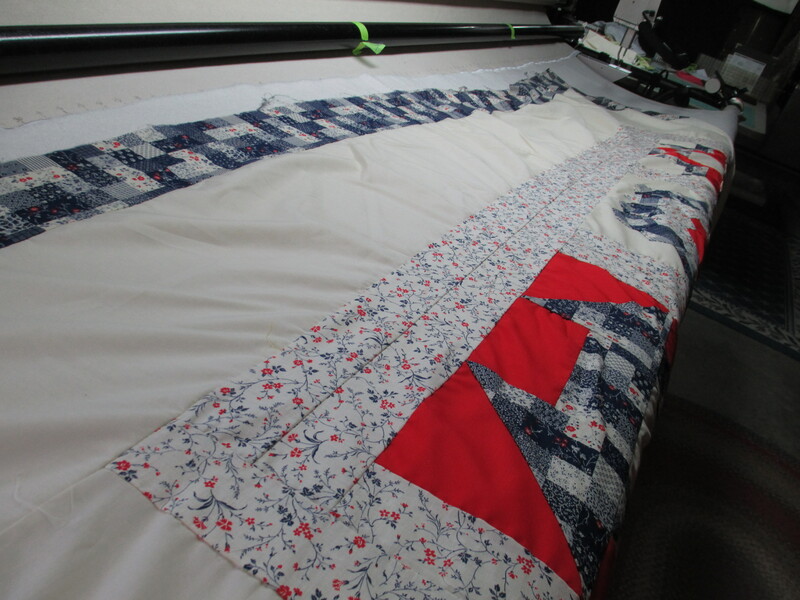 What are your thoughts on machine quilting a hand-pieced quilt top? Tough Decision, huh? 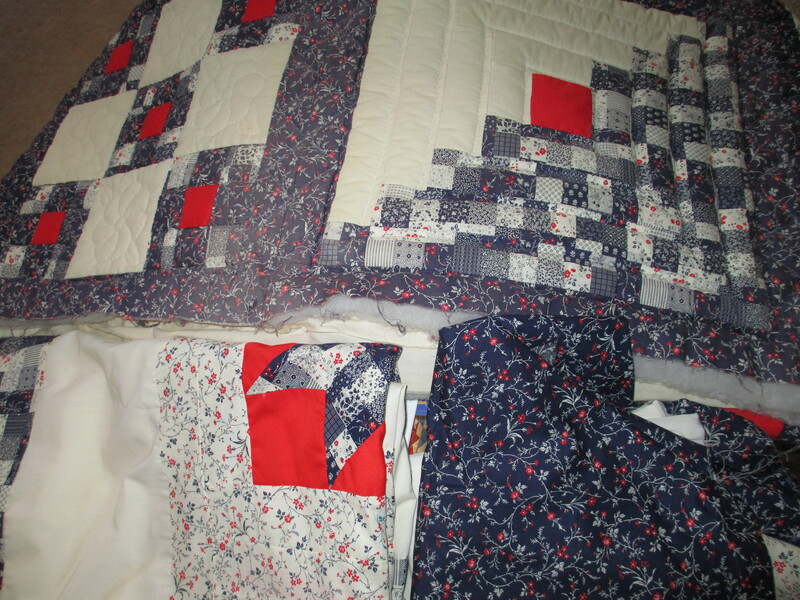 Hand pieced quilts are certainly a treasure. 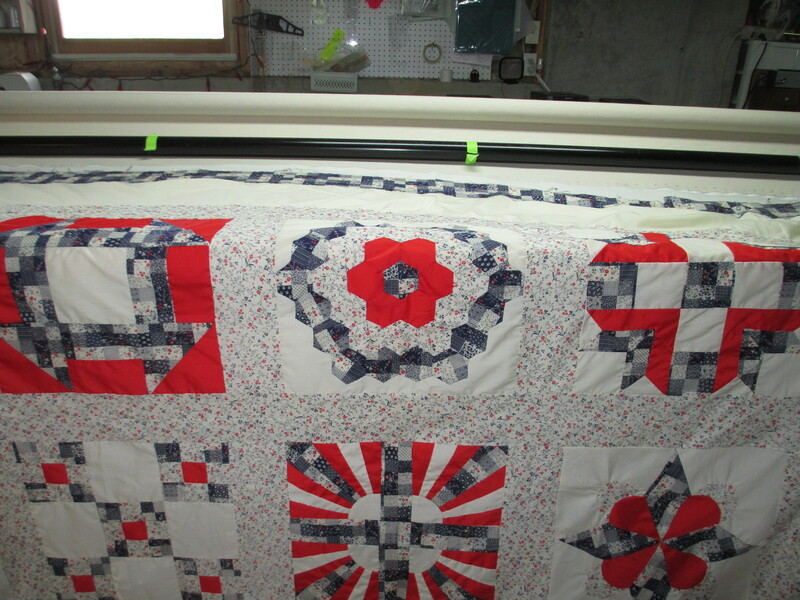 Unfortunately, most of us don’t have time for hand quilting so I feel it is much better to finish the quilt . Machine quilting is beautiful also and the top is preserved and stabilized for the family to enjoy!